Apple is headed back to the classroom to try and improve its marks with educators. At an event at Lane Tech College Prep High School, Apple is expected to introduce a new lower priced iPad in a bid to get students and school administrators, to start thinking Mac again. Unlike most recent Apple events, this will not be live-streamed on Apple.com. It starts at 11 AM Eastern and USA TODAY’s Ed Baig (@edbaig) will post from the event. The video of the event will be available for viewing at a later date. While in Chicago, at the school, Apple CEO Tim Cook will do a one-hour special for MSNBC, “Revolution: Apple Changing the World,” with MSNBC’s Chris Hayes and co-host Kara Swisher from Recode. It airs Friday April 6th at 8 pm. Giving as clear a signal as any that the Chicago event is all about the classroom, MSNBC says the “Revolution” special will “dive into Apple’s plans to innovate in the classroom and beyond,” focusing on Apple hardware and software tools to learn how to code. Apple is way behind when it comes to tech tools for students. Google, with its ultra-cheap Chromebook laptops, now owns the highly coveted education market, with a 59.6% market share of K-12, compared to 25.6% for Windows and just 10.6% for iPad, according to Futuresource Consulting. With good reason: you can buy a Chromebook computer for as low as $200, and unlike the iPad, it comes with a physical keyboard. The lowest priced iPad, the fifth-generation 9.7 inch iPad, is currently $329. The new model could be priced $70 less, around $259. It would be, of course, be even lighter to tote in a backpack than a Chromebook. Because Macs are so expensive, iPads have outsold them at schools by about three to one, Futuresource says. 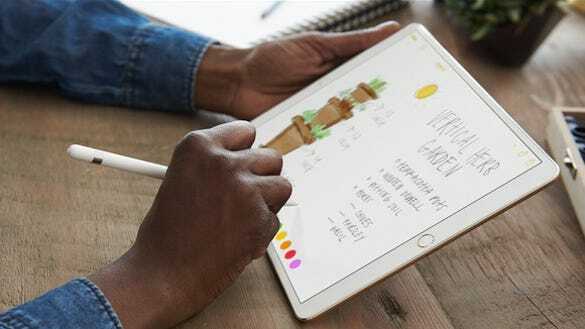 Apple is also expected to update the Pencil product, the $99 drawing tool that currently only works with the more expensive (starting at $649 and $749) iPad Pro models. Winning over students is the easy part — they already love their iPhones. Apple’s next challenge is talking dollars and cents with the administrators who approve purchases.